It’s not every day that a school bus pulls up to TDS–but this morning one arrived at 5:30 a.m. and left filled with pens, notebooks, backpacks, and other school supplies donated by employees and the public. Stuff the Bus is an initiative put on by the Lions Club to collect school supplies for families in need, as it costs approximately $630 to send a child to school. This can be a large financial burden especially for families that send multiple students to school. “Back to school should be an exciting time for children and their families. This program helps families in need focus on that excitement rather than questioning how to pay for the required supplies, and TDS is proud to support it,” said Sharon N. of TDS. TDS has been running a school supply drive to benefit students for 20 years. This year we teamed up with the Lions Club to support Stuff the Bus for the first time. Yesterday, a group of employees sorted and counted the supplies to get ready for the bus’s arrival. 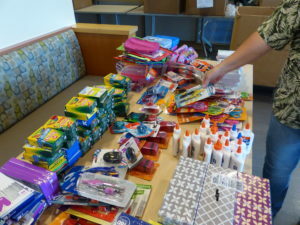 Employees donated 856 school supplies. The donated supplies will benefit Madison Metropolitan school district’s most disadvantaged elementary schools. “Whether you donate a pink eraser or a ream of printer paper, your Stuff the Bus donation makes a difference in the lives of Madison’s neediest school children and takes some of the burden off of the teachers,” said Jodi B., district governor at Lions Club.